If you’re looking for Robotic Toys for kids, the top engineering wonders in toys, but you also want great entertainment for your child, then check out the Meccano toys. Their toy robots are so fascinating and fun that kids won’t even realize that these are also fantastic learning toys. Isaac Asimov’s ScFi and robotic stories are still among my favorites and my son likes them too. No wonder he put the Meccanoid G15 top of the list for Christmas already. This educational toy teaches kids about engineering, about movement and dexterity and how to create with technology. , check price on Amazon, kids won’t have a problem being able to program and use it. The tools needed to put the pieces together are included in the box along with the instructions to take them step by step through the process. By the time a child puts the robot together, it will be able to move its head and arms as well as move forward thanks to the motorized feet. It does have LED lights and there are more than 500 different colors in play with the robot. This particular robotics set can be integrated to work with other Meccano designs. Once the robots toy is set up, kids can program it. If your child doesn’t have any experience working with programming, that’s okay. He’ll still be able to get the hang of using the program features with this robotic toy. The robot has three modes that can be used. Kids can use motion capture, ragdoll avatar or LIM which is Learned Intelligent Movement. With motion capture, this is basically a copycat mode. What happens with this is that the robot will do what you do when you put a smartphone on the chest of the MeccaNoid. The ragdoll avatar is an application that you can use to control the movements of the robot. The LIM is when the robot will follow suit of what you do or say. If you move the robot’s arm, then he’ll move it. If you say a word, he’ll say the word. You can command the robot as soon as you get him up and running and he’ll understand you because he already has more than 100 commands that he understands but you can program him to be able to understand much more than that number. The G15 robot has the ability to do some pretty human type actions such as tell you a joke or play a game. It’s so sophisticated that it can understand its surroundings and will adjust to those surroundings. It has 64Mb of memory and can be updated. It’s compatible with Bluetooth, has a rechargeable battery and eight serves that enable it to be able to communicate. Thanks to the Meccano Maker System, kids are also able to rebuild the robot as a dinosaur, a dog or anything else they can imagine. You can read what other have to say about the MeccaNoid G15 right here on Amazon. Childrens robot kits are some of the hottest toys on the market today and there’s a good reason why you’ll want to consider buying them for your kids. By using robotic toys, interacting with them, playing with them, building them and programming them, you give your child an educational boost. But there are more cool robotic toys. 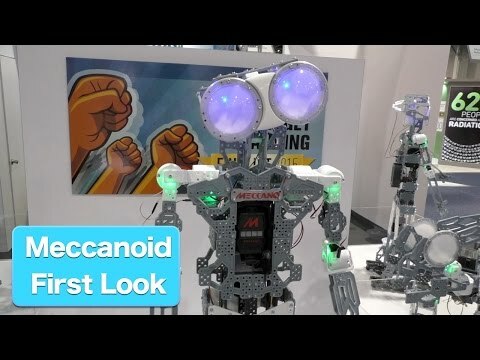 The 4 foot tall Meccanoid GS15KS, another model of the company, is an extremely advanced robotic toy that kids will love because it has even more interactive features. One of the features that it has the ability to do is that it knows the owner’s voice commands. The GS15KS is so sophisticated that it can freely interact with people. It has the ability to have a conversation with kids because of the huge database of phrases it already knows. It’s so intelligent that it can even talk to you about facts you might know or it can make you laugh by sharing a joke. When you’re quiet, the robot can speak first just like another human can. If you tell the robot what your name is, he’ll store that in his database and be able to recall it at a later date. The robot has LIM which is Learned Intelligent Movement coupled with Motion Capture. While it comes with the ability to be able to understand more than 100 commands, users can add more. The robot understands when it’s commanded to make certain movements. You can instruct the robot to take a step to the left or right or to go backward or come forward. Kids can program the robot to be able to respond to commands that they think of. When he moves, it looks realistic because he has 8 servos that are working to make the movements look natural, it can even move its neck. The robot is able to work with the use of a smartphone app. All you have to do to make the robot move is to create the movements on the app and the robot will respond. There are over 1,000 pieces to the robot. He comes with a charger, a rechargeable battery (while the G15 uses 4 C batteries instead), a Meccabrain, tools and other assembly pieces. The GS15KS is a great gift idea for kids between the ages of 10 and older, but a bit pricey. You can check the actual price and read helpful reviews right here on Amazon. A basic understanding in robotics for kids will help in understanding Science, Technology, Engineering and Mathematics. With robotic toys for kids they learn skills that help them be more effective in the way that they learn and are able to apply that learning. Honestly I can´t tell what the best robotic toys are, but I am pretty sure that these two toy robots are a good choice. P.S. It’s fun to show kids that science can be so much fun! Please join me on my next article about the Project Mc2 Ultimate Lab Kit.